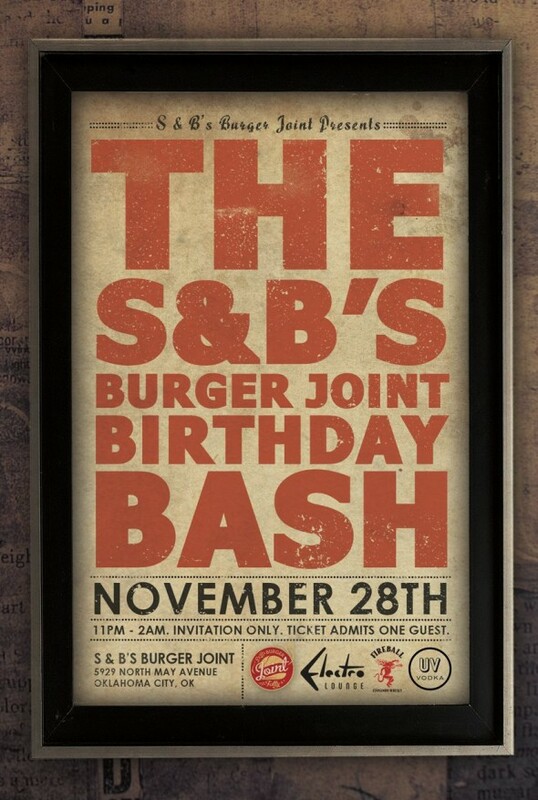 S&B’s Burger Joint wants to give something back to you. Unless you’ve been living under a rock for a few years, you should know about S&B’s Burger Joint. Yes, not only did they take the number one spot for “Best Hamburger” in the Gazette’s Best of OKC readers’ poll this year, but they did so for the second year in a row. Yes, they have the most original and inventive gourmet burger menus in Oklahoma. Yes, they have been around for five years, and have been celebrating their anniversary with special menu offerings at their original location this month. But, to me, this is not why you should know them. I’m sorry. I have to give a brief history lesson to all of you that are not like me –that is to say, those not 30-ish and above with an active -or, previously active- nightlife. You see, I came to know of the Burger Joint not because of what it is, but because of what it used to be. Yes, the original S&B’s has been around since 2009, but for about ten years before that it existed as a bar called the Electro Lounge. Located in the bottom floor of the office building in the Best Buy parking lot at NW 59th and May Ave. in OKC,the Electro Lounge was the brainchild and baby of owner/operator Bryan Neel. For over a decade, Neel cultivated an environment based on his penchant for ’80s and ’90s music culture. The climate of the Electro was one that supported local and touring DJs and bands alike. On top of that, it supported the drinking habits of many a hipster. There was always good beer, and Bryan had a predilection for cocktails. In fact, his affinity for Bloody Marys is a legacy that’s carried over to S&B’s current menu. Basically, the Electro Lounge was the little hipster-dive-that-could. But then one day it wasn’t there. Then, one day, on a whim, you go to a night club that you like, and used to frequent a lot more, but that night club was not there anymore. Now, there was a burger place. Okay, it didn’t happen in just one day. Let’s just say Bryan teamed up with Shannon to start a burger empire, and it’s going well so far. However, they’re turning five and they’re not forgetting their roots! 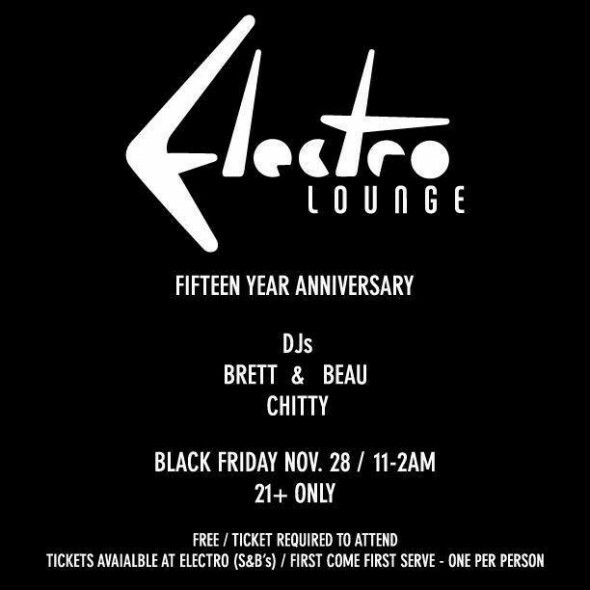 This Friday, the 28th –yes, Black Friday– when the original S&B’s location closes its doors, it will reopen them a short while later as the Electro Lounge. Sponsored by Fireball and UV Vodka, the event takes place from 11pm-2am, is 21+ to enter, and will feature guest appearances by old-school Electro Lounge DJs including Chitty Chitty Bang Bang, Brett & Beau, and, rumor has it, Bryan Neel himself. Now, when I inquired about this soirée, S&B’s management stressed to me that this is an exclusive event. Like, you-have-to-have-a-ticket-to-it exclusive. They couldn’t stress it enough, it seemed. Which is odd, when you consider how inclusive it all is. All you have to do to get a ticket is go to your nearest S&B’s, and they’ll give you tickets free of charge. Or you can friend them on Facebook. Hm… go figure. No, you will not be able to get a burger! Yes, you will be able to dance (to good music)! Yes, you will be able to drink (great cocktails) and have an awesome time! Well, played, S&B’s. Well played. Tagged Bloody Marys, Brett Beau, Bryan Neel, Burger Joint, Chitty Chitty Bang Bang, Electro Lounge, Facebook, OKC, Robotic Wednesdays, Shannon Roper. Bookmark the permalink.